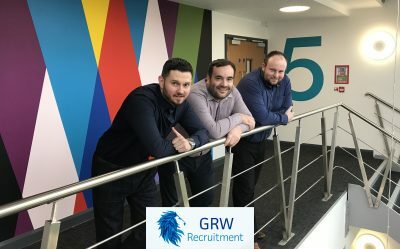 GRW Recruitment was formed in 2015 after identifying a lack of dedicated focus to the regions thriving contact centre industry. The GRW Recruitment staff have over 35 years combined contact centre experience from agent to operations level. Since opening their doors they have placed over 400 individuals into full-time permanent employment with a further 100 into temporary positions. They maintain a refreshingly-open and innovative approach for both candidates and clients and offer both permanent and temporary customer service and sales roles. The GRW training arm of the business offers unemployed individuals from across the northeast a chance to attend a pre-employment call centre course to give vital exposure and experience prior to attending a guaranteed interview at one of 4 main contact centres throughout the region. As a result of the success of the last 3 years, GRW is now going through a period of growth and expanding the training section of the business with additional staff and a satellite office. Graham Rose, Managing Director at GRW Recruitment, said; “When we were looking for premise for our business we found that no other centre compared to Hope Street Xchange. The staff are very friendly, organised and always willing to help. The building is the perfect setting for our business and we’re proud to have our visitors come to this hub of innovation and creativity. It sets out the perfect business vibe”.